The GAU-LB-400 Low Bay LED light consumes 40 watts of power while producing 1,462 lumens of white light. 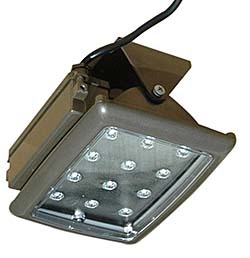 Features compact aluminum housing and 12 high output LEDs protected by a polycarbonate lens. The housing is powder coated, and is fully water and weatherproofed. The mounting assembly is vertically adjustable.